Ready yourself for the apocalypse with fresh breath and ward off possible attackers with extra brains! 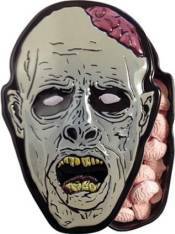 This zombie tin is filled with 1.3 ounces of brain-shaped mints. Sold Individually.